The Perseid meteor shower is the most widely observed and dependable annual meteor display of the year, and its peak this week has all the earmarks of being an excellent example of celestial fireworks, weather permitting. 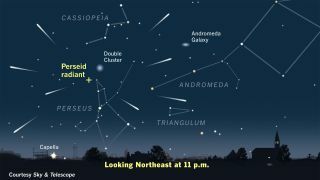 This year, the Perseids will peak in the overnight hours of Wednesday and Thursday (Aug. 12 and 13) just one day before the new moon. Unlike last year, when a brilliant and nearly full moon washed out all but the brightest meteors, 2015 should be a very opportune year for observing "shooting stars" with your own eyes or cameras. Today, NASA released a video on how to see the 2015 Perseid meteor shower. Most meteor showers evolve from comets, and the Perseid meteor shower is no different. It is made of pieces of Comet Swift-Tuttle, a comet first discovered in 1862 that takes 133 years to make one trip around the sun. Comet Swift-Tuttle was last visible in the night sky in 1992 and won't return until 2126. Comets are composed chiefly of frozen gases, but the meteoroids that are mixed in with that gas — bits and pieces that have flaked off from the comet’s nucleus — are very flimsy. When a comet nears the sun, its nucleus sheds clouds of rubble that spread out along its orbit, creating a continuous "river of dust" moving in the same direction as the comet. Each time Earth passes through one of these rivers, the planet gets a meteor shower. The particles responsible for most of the streaks of light that observers see are quite small, ranging in size from large grains of sand to small pebbles, but with the consistency of cigar ash. They're invisible until, upon entering Earth's atmosphere with immense velocity — 37 miles per second (60 kilometers per second) — their kinetic energy is used up in such processes as the production of light and heat, and ionization. They cannot survive the shock of entry, so they streak across the sky in a brief, blazing finale. Such a small particle can be seen as a "shooting star" for hundreds of miles. In most instances, the particles first become visible at about 70 miles (112 km) above the ground and die out at a height of about 40 miles (64 km). The Perseid meteor shower debris stream intersects the orbit of Earth more or less directly, but on its way in toward the sun it also passes other planets. In the case of the most massive planet in the solar system, Jupiter, there is no direct encounter; the dross of Comet Swift-Tuttle passes well above this giant world, never coming any closer than about 160 million miles (257 million km) at 11.8-year intervals, the time it takes Jupiter to make a complete orbit around the sun. But on those occasions when the planet is passing closest to Swift-Tuttle's river of dust, Jupiter's powerful gravitational field can still slightly perturb the comet particles, just enough to nudge them closer to the Earth. The result is usually an enhanced Perseid display, producing more than the usual complement of meteors. Most years when the Earth encounters the Perseids, observers blessed with a very dark, clear sky might count as many as 90 meteors per hour (if you live in an area where haze, smoke and bright city lights are common, you will likely see a lot less). When Jupiter has had an influence on the Perseid orbit, the meteor numbers tend to ramp up to above-normal levels. As it turns out, Jupiter recently passed closest to the orbit of Comet Swift-Tuttle in November 2014. It then takes another 22 months for the meteoroid stream affected by Jupiter to arrive in the vicinity of the Earth. This means that the Perseid meteor shower of 2016 could offer an unusually amazing display of numerous meteors. This so-called "Jupiter effect" is so pronounced that years immediately flanking its peak can also see higher than normal meteor rates. And 2015 is one of those years. What do the Perseid pundits say? In the Observer's Handbook of the Royal Astronomical Society of Canada, Margaret Campbell-Brown and Peter Brown note that "Some models predict an enhancement in activity from the Perseids on Aug. 13 at around zero hours Universal Time." One such model was developed by French meteor expert, Jeremie Vaubaillon. It shows the Earth moving along in its orbit, encountering a significant swath of Perseid activity over a period of approximately 18 hours, traversing nearly 1.2 million miles. You can see a map charting that interaction here. Another noted meteor expert, Mikhail Maslov of Russia, speaks directly of the Jupiter effect and forecasts higher-than-normal Perseid rates — perhaps up to 120 per hour — during the early hours of Aug. 13. He writes, "From 2015 to 2017, the Earth will encounter the perturbed part of Perseid stream, which was shifted closer to the Earth's orbit by Jupiter's gravitation. This means that in these years we have to expect heightened Perseid activity. For 2015, the shift amounts to about 418,000 miles [673,000 km], so in 2015 the Perseids are expected to give higher than usual activity compared to recent years." The International Meteor Organization (IMO) also alludes to the Jupiter effect, stating, "It is highly likely that this year the overall activity of the Perseids will be somewhat elevated due to a favorable gravitational perturbation by Jupiter." It is not necessary to continuously stare at the constellation Perseus itself to see the Perseid meteors. A Perseid may appear in any part of the sky, but its trail, if mentally traced backward, invariably leads back to Perseus. Typically the meteors appear as bright, swift streaks. A few outstandingly bright meteors (fireballs) occasionally may be seen. Fainter meteors appear white or yellow; brighter ones appear green, orange or red. About one-third leave luminous trains, which may be spectacular, and can persist for many seconds; the brightest meteors often end in flares or bursts (called "bolides") and are even capable of casting shadows! In his book "Splendor in the Sky" (Harper, 1961), the late British astronomer Gerald S. Hawkins wrote, "I have watched the Perseids on many occasions. I am always impressed by this event and look forward to the shower as an old friend." Indeed, this beauty in the skies, nature's free gift, will be worth watching for. Good luck and clear skies!